Though the tradition isn’t as widely done as it once was, decorating your wedding car is a very fun way to add a little more fun to the day. There are few things more iconic about a wedding than the stereotypical car driving away from the chapel dragging empty soup can, and that makes this tradition still a very popular one by any standard. Fortunately, there are several new ways to decorate your wedding car that are a little less antiquated. Here are some of those ideas as well as some general pointers when deciding on how to go about decorating your wedding car. First, you’ll need to choose a car. Typically, you would choose either a limousine or some type of luxury car, but pretty much anything will do just fine. However, if you plan to do something like a banner or flag (discussed below), you may want to consider a larger vehicle like a pickup truck or an SUV. Though it’s possible to accomplish, using those types of wedding decorations on a passenger car isn’t advisable. We’ve all seen it a hundred times; the tin cans dragging on strings behind the car. Though this is a little cliché and “old school”, it is still a viable choice and it is still very common to this day. Many couples are choosing something a little less quiet these days, but the choice is really yours. Probably the most common type of wedding car decoration, window paint allows you to write any message you want on the auto glass and erase it with ease when it’s time to get rid of it. You can even get them in a marker form these days to make the application process even simpler. Just make sure you buy actual car window paint and that it won’t stain the car’s paint or that you are allowed to decorate your rented wedding limousine. If you have a large enough vehicle, you can proudly display a banner or flag that says “just married” or whatever wedding-related message you prefer. This is a great choice if you want everyone in the world to see that you’re now married, plus it is relatively easy to put the vehicle back to normal once you’re done. 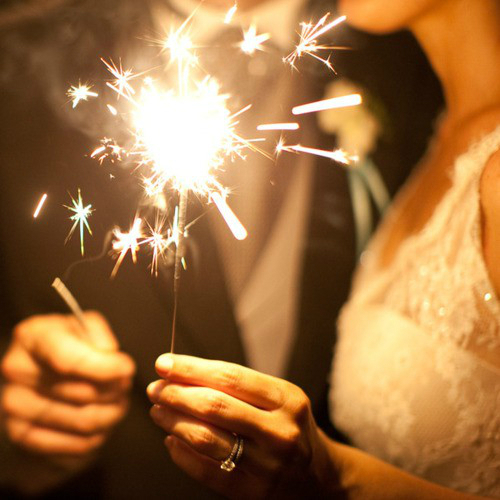 Though not technically a decoration, you can certainly make the experience better by using some sparklers while you’re departing your wedding venue. While I certainly don’t advocate using fireworks while you are driving, buying some cheap sparklers for weddings and holding them out the window for 30 seconds isn’t going to hurt anyone if you are careful. However, the decision to take that risk is entirely on your shoulders. If you decide to decorate your wedding car, there are a few things to avoid. First, make sure that any adhesives, paints, or any other material that touches the surface of your wedding car is safe for the paint. You don’t want to damage the car just to add a silly message on the window. Also, if you are renting your wedding car, make sure your rental agreement allows you to decorate the car. You don’t want to get slapped with a fine over some tins cans tied to strings.